Global teams are now officially the way of things. Spanning the boundaries of countries, languages, business units, and entire enterprises, we now find ourselves working with and managing people we've never even met — and in many cases, we never will. Everything about such projects or operations is more difficult than face-to-face teams. 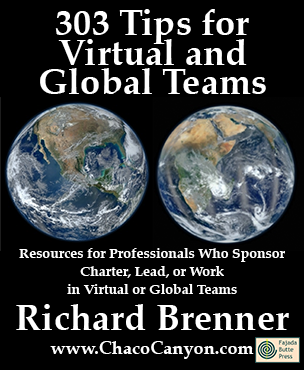 Read this ebook for a comprehensive set of ideas for making your global team sing! 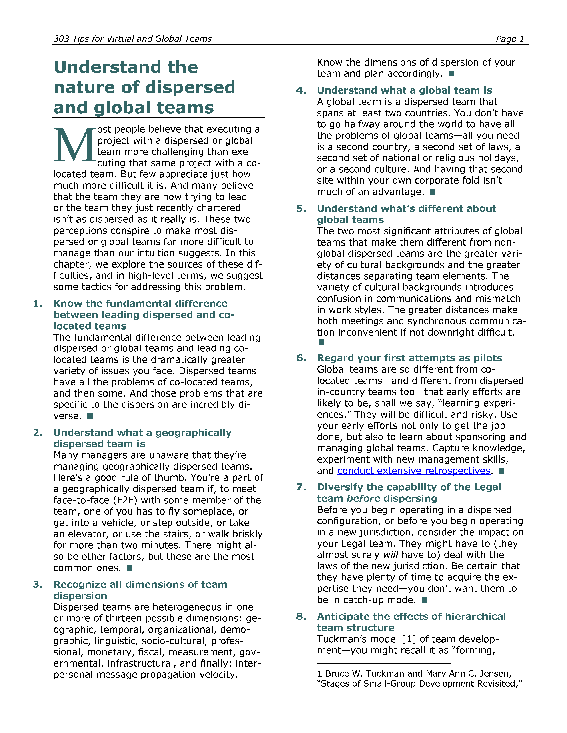 You'll find various definitions of global team if you surf around a bit, but the main features of global teams are what make them so difficult to manage — the people are dispersed geographically, they meet infrequently or never, and they come from different cultures. 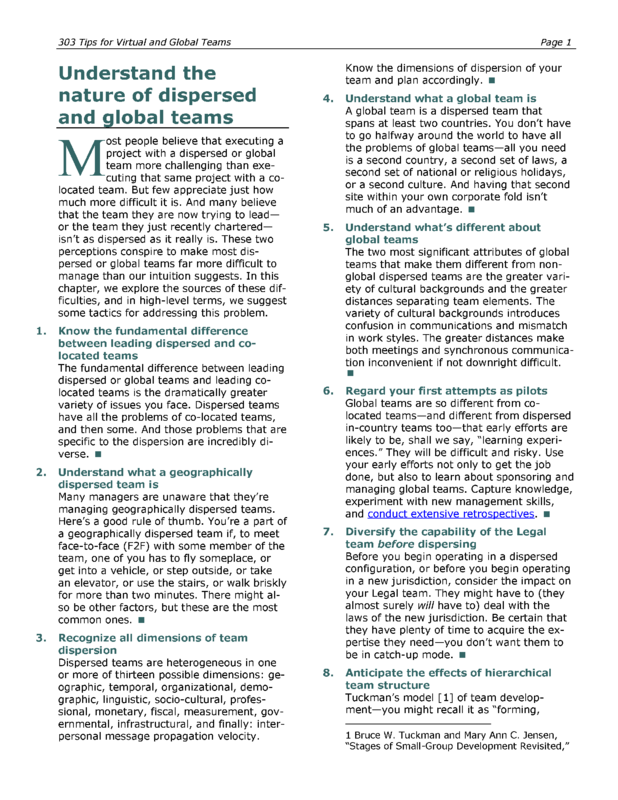 The key to success for a global team is building a sense of team despite the obstacles of separation. Looking for an economical training alternative? Seek people who have a knack for finding a "third way"
Manage your expectations about "buy-in"
This item is also available in 10-copy packs (USD 16.70 per copy), in 50-copy packs (USD 13.30 per copy), in 100-copy packs (USD 11.29 per copy) and in 500-copy packs (USD 9.32 per copy). 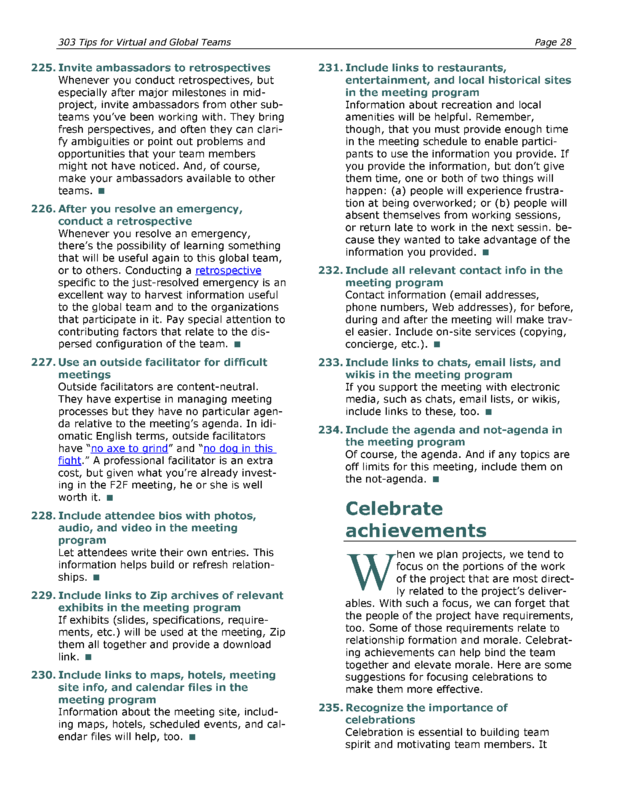 303 Tips for Virtual and Global Teams is in Acrobat format, which gives you several advantages. 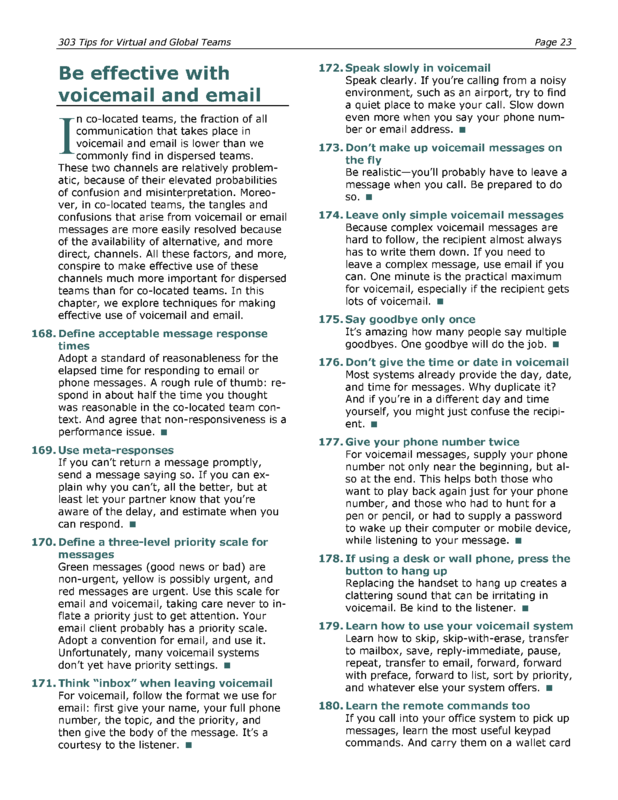 You can print it, and read it like any book. 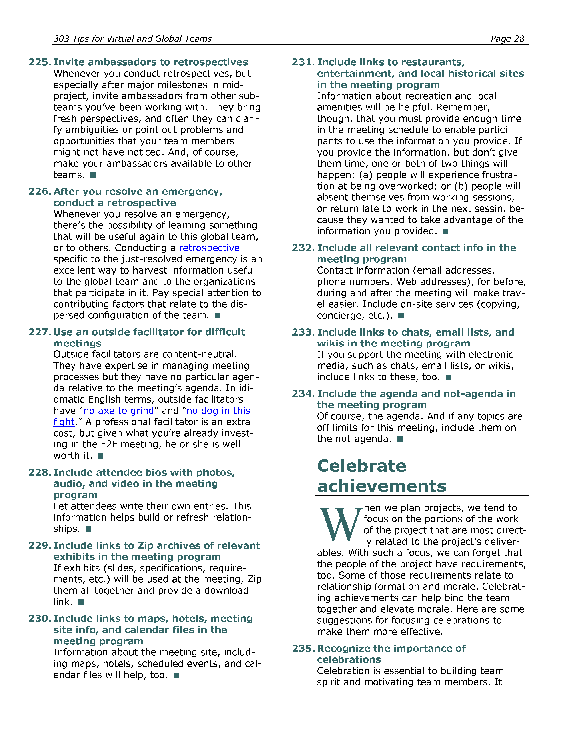 Or in electronic form, you can use the search capability of Adobe Reader to find passages of special interest to you. If you load it onto your laptop, tablet, or other mobile device, you can read it anywhere — and it's weightless, too. 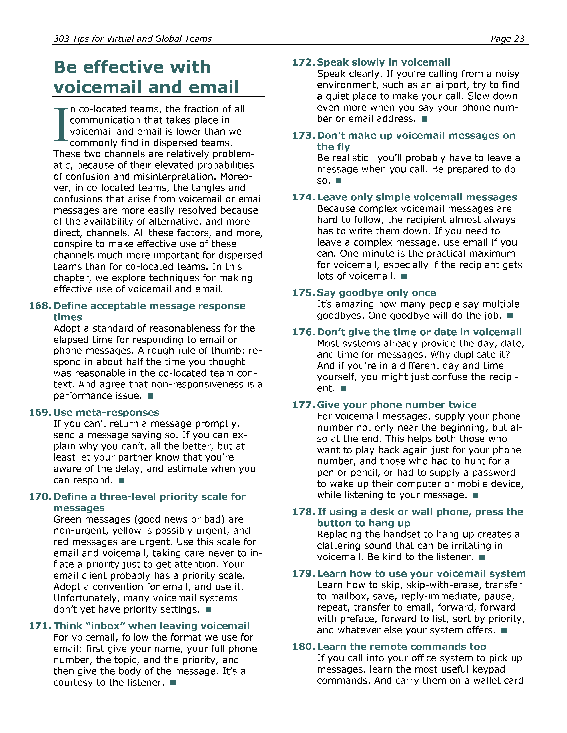 49 pages.